All of the featured recipes from the Vincent on Camelback dinner are from the book “From Julia Child’s Kitchen,” with the exception of the salmon in puff pastry, a dish that Vincent prepared for Julia Child at a dinner. As a delicious bonus, those who attend either “Julie & Julia” dinner will receive a free bag of popcorn at Harkins theaters and if you bring in a “Julie & Julia” ticket stub, you’ll receive a free dessert from Vincent. Sweet! 3930 E. Camelback Rd., Phoenix, 602.224.0225, https://www.vincentsoncamelback.com/. Meryl Streep is Julia Child and Amy Adams is Julie Powell in writer-director Nora Ephron’s adaptation of two bestselling memoirs: Powell’s Julie & Julia and My Life in France, by Julia Child with Alex Prud’homme. 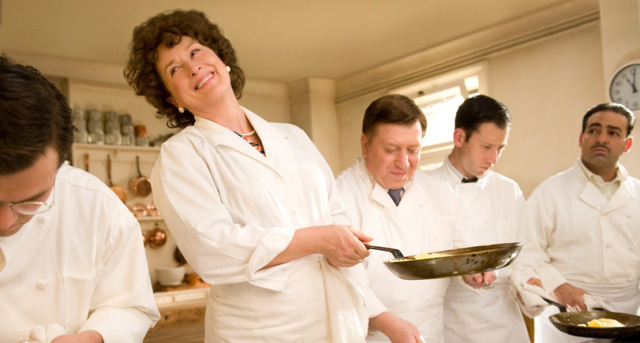 Based on two true stories, “Julie & Julia” intertwines the lives of two women who, though separated by time and space, are both at loose ends…until they discover that with the right combination of passion, fearlessness and butter, anything is possible. what a cute idea for the menu. i really dont want to see this movie at all – the trailers are so boring – but i like Vincent’s idea. I think the movie looks cute, but I heard the book is better so I’m going to read it first.